Edhat Purchases De La Guerra Plaza! 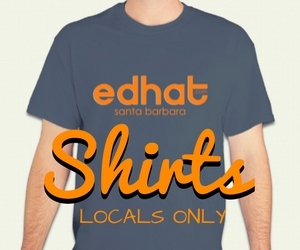 In a newly brokered deal with the City of Santa Barbara, Edhat has purchased De La Guerra Plaza. Curious where to celebrate the luck of the Irish? Check out the events throughout town. Happy unofficial Pi Day! Check out the local deals from pizza pie to dessert pie. Getting up an hour earlier than expected is rough, but here are some tips to survive Daylight Saving Time. While everyone is enjoying their much needed day off work, catch up on some interesting President's Day facts. Did you know over half of the American population will spend $30 billion on Valentine's Day? Santa Barbara Honors Martin Luther King, Jr.
Santa Barbara is honoring Martin Luther King during the free annual MLK Day events. Several dictionaries announced their 2018 words of the year, some you may not recognize and others you may find silly. Check out edhat's top stories from 2018 with our Year EnD review and photos. Happy New Year, it's 2019! Oh sorry, was that too loud? Shh..it's 2019 for those who might have imbibed a bit too much last night. What are your resolutions for 2019? Take our edhat poll. All of us at edhat would like to wish everyone a Merry Christmas with a few fun facts about this holiday. Holiday Parade Santa Hat Contest Winner! [Winner! ]: The edhat winner of our annual Santa hat counting contest has been announced! The most anticipated shopping day of the year has arrived, but where are the best Black Friday deals? Reflecting on the positive side of this holiday, what are edhat readers thankful for? Thanksgiving is more than turkey and pie, learn more about our National food-focused holiday. [Update]: Ed has announced the winning pets in costumes, check to see if you're a winner! Romance is alive and well in S.B! A reader comes across a man leaving a trail of roses as he prepares to propose to his girlfriend. Where's the Best Burger in Santa Barbara County? It's National Cheeseburger Day, so who serves up the best burger in Santa Barbara County? Win VIP Tickets to Blondes vs Brunettes Flag Football Fundraiser! [Winner Announced!] We have 2 VIP tickets to giveaway to one lucky edhat reader for Saturday's Blondes vs Brunettes flag football fundraiser game. Enter now! Win Tickets to Santa Barbara Wine + Food Festival! [Winner Announced]: We have 2 tickets to the SOLD OUT Santa Barbara Wine + Food Festival this Saturday and you could win them! [Winners Announced]: We have 4 passes to the Live Oak Music Festival this weekend, enter now for a chance to win them! Ticket Winner Announced to See Michael Franti & Spearhead! [Winner Announced!] Enter now for a chance to win 2 tickets to see Michael Franti & Spearhead on Thursday at the Live Oak Campground. Caption This Photo, Win a Prize! [Winner Announced]: Provide the best caption for this photo and you could win an edhat prize! Who Will You Vote For? Take Our Edhat Poll! Tuesday, June 5, is election day. Take our edhat poll to select who you will (or already did) vote for! Learn more about the holiday where we celebrate our moms! It's Friday, May 4th and you know what that means... "use the (fourth) force Luke." Happy Star Wars Day. The Santa Barbara Fair & Expo opens Wednesday at the Earl Warren Showgrounds and edhat has tickets to giveaway! Enter now.